Mike brought home some of that pencil thin asparagus that he likes you know the one that takes just a few minutes to cook through so I thought something simple and rather quick was in order to go with our pork chops…I love mushrooms of all kinds so this recipe is going into the keeper file and I can imagine it as another side for a steak dinner. 1/4 cup butterClean, trim and halve the mushrooms (or quarter them if they’re large). Bring a saucepan of water to the boil, add a little salt, throw in the asparagus and cook for 3–4 minutes, until just tender, then drain them. Heat the olive oil in a frying pan over a medium heat, add the mushrooms and sauté gently until they are tender and the liquid they release has evaporated. St George’s mushrooms need a fair bit of cooking and don’t contain that much water, so keep the heat low to avoid drying them out before they’re cooked through. 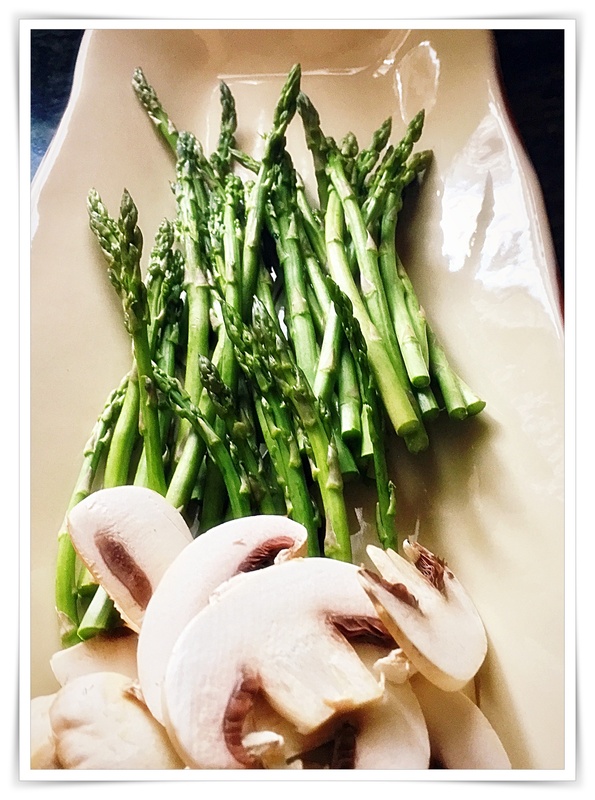 Add the steamed asparagus spears to the mushroom pan, along with the butter. Season with salt and pepper, toss around once or twice, then transfer to warmed plates and serve at once, with a crusty bread or rolls with butter.